Multi-tip punches are a cost-effective way to increase tablet output without the need for additional tablet presses. The use of multi-tip punches follows a similar principle as a single-tip tool for the rotary tablet press but there are operating techniques that must be understood for a successful tableting process. Two common multi-tip tool configurations for B and D tooling are assembled and solid type tools. When choosing which configuration best fits your needs, some things to consider are tool type (B or D), tablet size, number of tips and particle/ powder characteristics. Assembled punches consist of a punch body, caps and tips, which accommodates replacing the tips without the need to purchase a whole tool body. The solid design offers easier cleaning, minimised assembly times, reduced rust potential and less risk of cross contamination. Rotating heads are a common feature for multi-tip punches, especially on lower punches and should be considered for any multi-tip punch use. Here, we point out the critical stages of the rotary tablet press process and describe what impact multi-tip punches have at each step and how to overcome the common challenges found in the tablet compression industry. There are six areas of concern during the die filling process in which multi-tip punches are directly affected. Each of these areas may need to be addressed when moving from a single tip to a multi-tip punch set up. Hopper level is the first area of concern. When product is initially loaded into the tablet press hopper, the powder must have adequate flow properties to successfully enter the feeder system. When multi-tip punches are installed on the press, the rate of product consumed is greatly increased and requires loading the hopper more often. Feeder speed is the next issue to consider. The feeder delivers the powder from the hopper to the die table. Using multi-tip punches, more product will need to be drawn from the feeder, requiring a higher feeder speed than is used for single-tip punches. The die fill process is also an area of concern. The lower punch is pulled down from the fill cam to allow overfill of the die cavity. The excess powder is then pushed out when the punch reaches the dosing cam. A worn-out tool, or a low-quality tool that is not within specification, can cause weight issues and punch binding as materials build up on the die wall. Multi-tip punches can exacerbate these issues and require special attention to tool quality. Work with a knowledgeable and experienced tooling manufacturer to ensure proper tool design and press set up. The next point to consider is the pull-down cam. Immediately following the dosing cam is either a tail-over die or pull-down cam. Both are designed to keep the powder in the die cavity before the upper punch enters the die. When utilising multi-tip punches it is imperative that the pull-down cam doesn’t pull the lower tip from the die cavity. This modification should be treated similar to that of the fill cam. Pre-compression is a de-aeration stage. This allows the removal of air and initial consolidation of particles to help with the main compression process. A multi-tip application may also benefit from the use of pre-compression, but with the increased number of tablets produced, the press speed can be reduced. The last area of concern is that of main compression. The final compression force on the rotary tablet press is a result of the amount of powder in the die cavity and the distance between the upper and lower punch tips. Assuming a concentric pressure roller and punches that are within working length tolerance, the resulting compression force will be similar for each turret station if the powder is uniform in fill. It is of special importance that the multi-tip punch working lengths are within tolerance since these force systems have no way of determining which tip is causing the issue. At the Natoli Institute for Industrial Pharmacy Research & Development located in the Arnold and Marie College of Pharmacy at Long Island University in Brooklyn, New York, a series of experiments were conducted to study the compression force impact from a single-tip, two-tip and four-tip 0.25” (6.35mm) round tool. The tools are illustrated in Fig.1 A direct compression blend consisting of 25% w/w of APAP and 74.5% SMCC 50 with 0.5% magnesium stearate was used for the study. A compaction profile study was performed on a benchtop rotary tablet press at 25rpm turret speed. Tablets were collected at varying force levels for each tool configuration. Resulting tablets were measured for thickness, weight and breaking force. Fig. 2 depicts the compaction profile for the three tools. It is clear that the compression force of multi-tip tooling must increase to achieve the same tablet breaking force as the number of tips are increased. One might think that since the area of the tool has doubled, it would require twice the force to achieve the same tablet breaking force as is illustrated in Fig. 3, but this may not be the case. Fig. 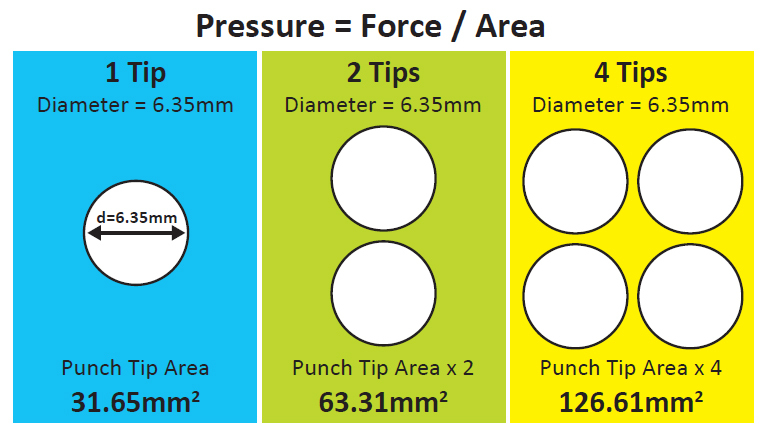 4 is the compaction profile normalised for the tablet geometry and punch tip area. 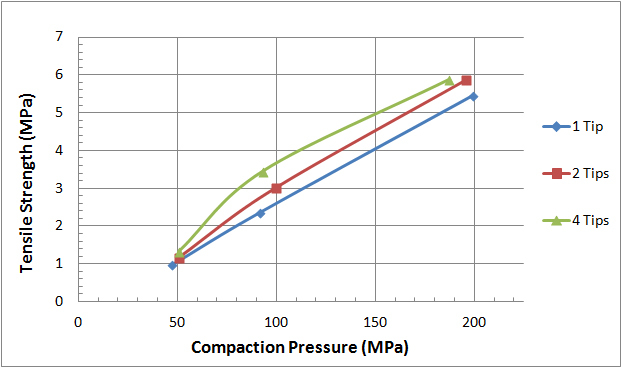 This gives a clearer picture of the resulting tablet strengths at different applied compaction pressures. If in fact the force is doubled when the tool area is doubled then the plots would superimpose. At the same compaction pressure, the two-tip tool configuration results in a 19% increase in tablet strength, and another 19% increase in strength from a two-tip to a four-tip configuration. 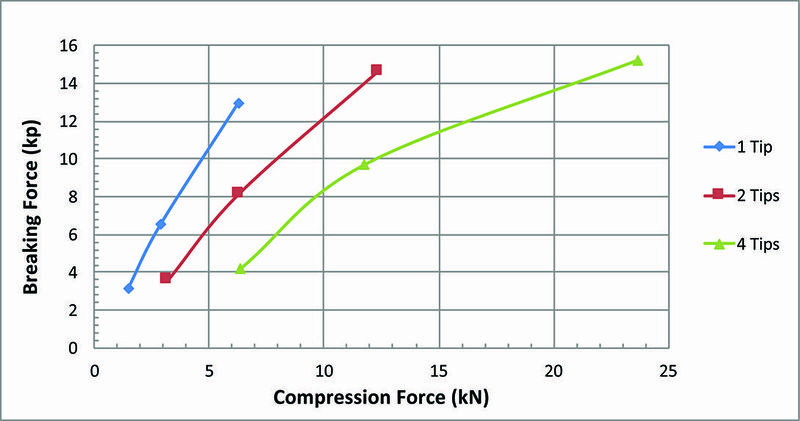 In this case study, the applied pressure or compression force would be less than double to achieve the same tablet strength. After the tablet is compressed the ejection cam will push the lower punch upward to eject the tablet. The ejection force is a combination of the residual radial die wall and coefficient of friction between the tablet belly band surface and the die wall surface. Excessive ejection force levels will cause premature wear to the lower punches, cams and may cause visual striations on the tablet’s belly band. Multi-tip punches increase the belly band surface due to the increased number of tablets. This inherently increases ejection force levels and the likelihood of having the aforementioned issues. Common ways to reduce the ejection force include increased levels of powdered lubricant to the formulation (i.e. magnesium stearate), tapered dies and lined dies of different materials. 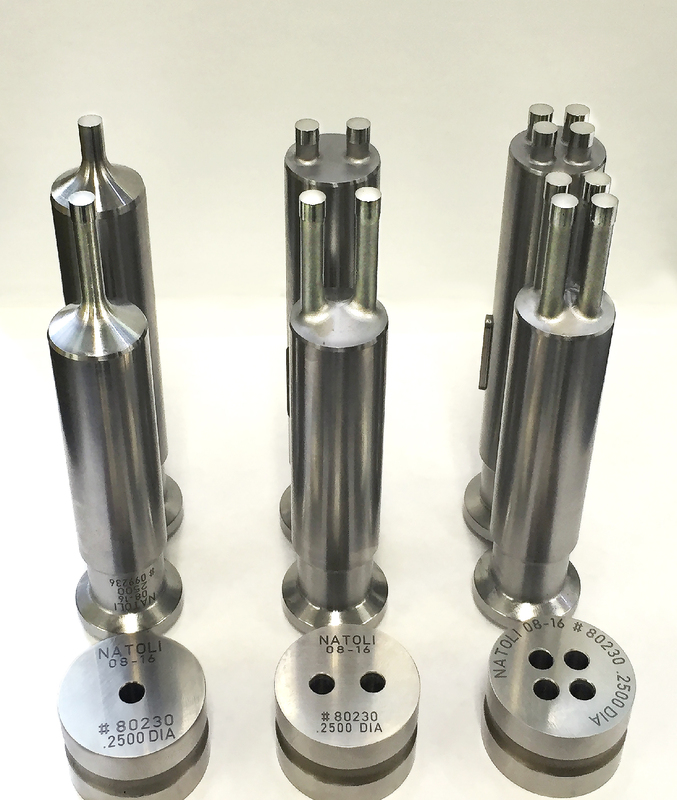 Although this case study was limited, it provides some exciting and intriguing information about the necessary compression forces for multi- tip tooling. As manufacturers often look to reduce costs and increase productivity, wear on tablet presses and tooling can be a concern. With the potential ability to reduce some compression forces necessary to produce quality tablets, opponents to multi-tip punches may have one less reason to be concerned. Robert Sedlock is a director of technical training and development at Natoli Engineering.